A rash may be localized in one part of the body, or affect all the skin. Rashes may cause the skin to change color, itch, become warm, bumpy, chapped, dry, cracked or blistered, swell, and may be painful. The causes, and therefore treatments for rashes, vary widely. Diagnosis must take into account such things as the appearance of the rash, other symptoms, what the patient may have been exposed to, occupation, and occurrence in family members. The diagnosis may confirm any number of conditions. The presence of a rash may aid diagnosis; associated signs and symptoms are diagnostic of certain diseases. 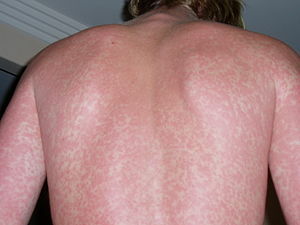 For example, the rash in measles is an erythematous, morbilliform, maculopapular rash that begins a few days after the fever starts. It classically starts at the head, and spreads downwards. Hidradenitis Supportiva Deep sebum filled cystic condition of apocrine gland overstimulation, caused by many internal and external factors eg, stress, toxic environmental overload and immune impairment. See Hidradenitis. 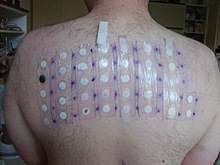 Treatment differs according to which rash a patient has been diagnosed with. Common rashes can be easily remedied using steroid topical creams (such as hydrocortisone) or non-steroidal treatments. Many of the medications are available over the counter in the United States.